AK47 NPAP Century Cugir Single Stack 10 round Magazines Lo-Cap 7.62x39 New Poly MA084 Buy 3 Ships Free! Description: NO MAGAZINE SALES into NEW YORK CITY. CONNECTICUT residents must furnish us a copy of your CT Eligibility Permit or ammunition certificate. This listing is for ONE magazine. This listing is for ONE Magazine; Buy 3 Ships Free: Combine any 3 of our non gun non ammo listing lots, and the entire order ships Free!.Here is Century Arms’s factory issue magazine for the NPAP Lo-Cap Rifles with single stack magazines. Century’s stock number on the current production rifle itself is RI2088, N-PAP Lo-Cap Semi Auto. At press time on this ad, we had the RI2088s in stock. 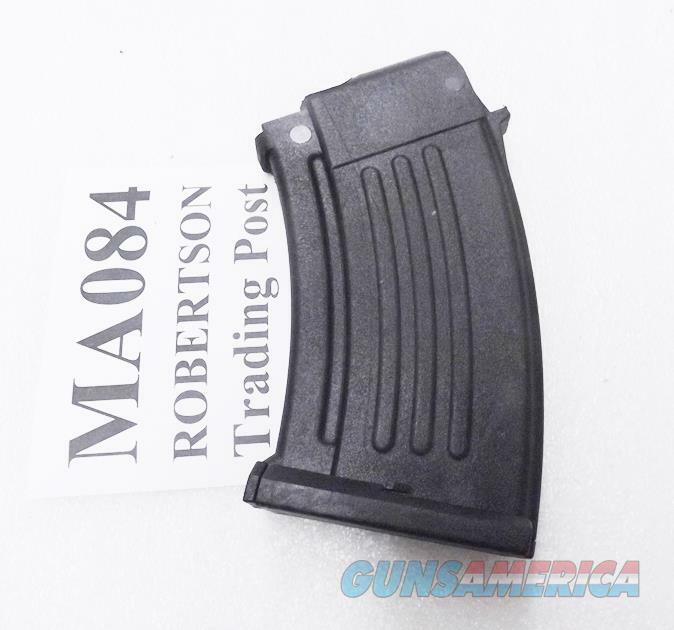 Manufacturer on these magazines is Zastava Arms PLC, of Kragujevac, Serbia. Importer and Warrantor is Century Arms of Georgia, VT. Construction is glass impregnated polymer, with serrated sides and stippled surface, with steel spring and steel inner floorplate. Each magazine holds 10 rounds of 7.62x39 caliber ammunition. Note that this is a Single Stacked magazine, not a double stack like the original 1947 Kalashnikov. It will not work in an AK47 or AK74 type rifle that accepts the standard double stacked magazines. It will only work in single stack variants, made by Cugir in Romania, or Zastava in Serbia. These magazines ship to us in bulk, each in its individual plastic bag. All of them are brand new and unissued. Replacement pricing on these ranges upwards of $30 apiece in many areas. We’re offering them each, however, for only	$ 9.00. Buy 3 Ships Free. GB Pay buyers will have their shipping refunded. Not for sale to residents of New York City. Any magazine deliveries into New York City require written permission from the Police Commissioner, so we cannot ship magazines into any of the five boroughs or 176 some odd zip codes, per NYC Code 10-131.10. Connecticut buyers must furnish us a copy of your State Issued Eligibility Permit or Ammunition Certificate, per P.A. 13-220. Any ammunition, firearms, or personnel showing in any of our photos are NOT included. $3 Lower 48 First Class Mail Padded Envelope; $10 Priority to AK HI PR. First Class sometimes requires removing the item from its package.